It was in the autumn of 1999 when Brenda & I visited a poultry dealer from Coventry that we made our first & only purchase to create the Large Silver Barnevelder. On that day we certainly did not have Silver Barnevelder’s on our minds. 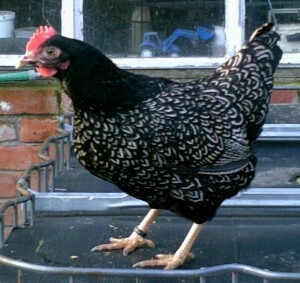 One of the few bird’s that took my eye was a Silver Laced Wyandotte pullet with a single comb. I immediately realised that this bird would be a good start to re-creating the Large Silver Barnevelder. The Large Silver’s had not been seen in this country for quite a few years I believe not since before World War 11. At that time it was only the large that had been standardized. More recently I managed to acquire Bantam Silvers from Holland of very good quality and these are now in the hands of various breeders in the U.K. 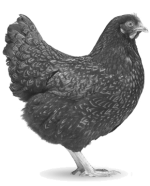 This enabled our club to apply for the Bantam Silvers to be included in the Poultry Club Standards in the Autumn of last year. This application was accepted in the November of last year by Poultry Club Council. The Silver Laced is double laced similar to the traditional colour but instead of the black and red/brown, they should be black and white, the red/brown ground colour is replaced with white.